Bosgoed Groothandel gaat de Coretec-vloeren van Usfloors in de Nederlandse markt zetten via de gespecialiseerde vakhandel en woninginrichter. Volgens Jan Dossche, President van Usfloors International (foto 1 inks), is Bosgoed door hun deskundigheid en het enthousiasme van Harry Elshof (foto 1 rechts) en zijn team een ideale partner voor Coretec (foto 2). Dossche stelt dat pvc klikvloeren tekort schieten en veel kwaad bloed bij consumenten hebben gezet. Coretec biedt daarentegen een zeer stabiele, watervaste oplossing voor zowel residentieel als commercieel gebruik. Coretec is volgens Dossche het succesvolste vloerenproduct in de VS van de afgelopen jaren. Deze wordt vanaf nu ook in Europa verdeeld. Op de eerste dag van Domotex werd tevens bekend dat Usfloors met Unilin en Vällinge Innovation licentieovereenkomsten heeft gesloten om de patenten (vloerplanken met waterbestendige kern van kunststof composiet) commercieel te gaan vermarkten door sublicenties aan relaties te verstrekken. Bosgoed zal het product, naast de nieuwe Mflor- en Paradorcollecties en rolgordijnen (Doing Dutch, foto 3) op 15, 16 en 17 februari presenteren op drie verschillende locaties (Staphorst, Valburg en Geleen). Met buffet vanaf 17:30 tot 22:00 uur. Daarvóór zullen Usfloor en Mflor vanaf aanstaande zondag tot en met woensdag 3 februari al op Intirio in Gent te vinden zijn. January 12th, 2016 — Hannover, Germany, — Following swiftly upon the issuance of USFloors’ third COREtec® patent, USFloors today entered into sub-licensing arrangements with both UNILIN’s Flooring Technologies and Välinge, granting each the worldwide right to sub-license USFloors’ COREtec® patents to their respective licensees. January 12th, 2016 — Dalton, GA, — USFloors’ third COREtec® patent issued today, providing the broadest protection to date for its COREtec® products. The United States Patent Office issued Patent No. 9,234,357 entitled, “Engineered Waterproof Plastic Composite Flooring and Wall Covering Planks,” which is derived from USFloors’ original COREtec® patent. While the first two COREtec® patents covered products with a composite core of plastic and a dust of either wood, bamboo or cork, the Patent 9,234,357 expands the claim coverage to include any plastic composite core, regardless of whether it contains wood dust or other additives and fillers, such as calcium carbonate. Today’s patent covers all engineered flooring products with a plastic composite core and a veneer top layer bonded with a waterproof adhesive, with or without the attached cork backing which has become a hallmark of the COREtec® brand. US Floors has already granted a number of licenses for its COREtec® patents and is actively offering licenses for its worldwide family of COREtec® patents. May 13, 2015 — Dalton, GA, — USFloors’ has added a Lifetime Petproof Warranty to its patent-pending COREtec Plus® engineered luxury vinyl flooring collections. The Petproof Warranty is in addition to a Lifetime Waterproof Warranty, Lifetime Residential Wear Warranty, and 10 Year Commercial Wear Warranty that have backed the products since introduction in 2013. The new warranty only applies to COREtec Plus® and COREtec Plus XL® products and warrants the floor against staining from pet accidents for the life of the floor. COREtec Plus® has a patent-pending construction consisting of a top luxury vinyl veneer layer attached to a dimensionally stable, waterproof WPC core and an attached cork underlayment which gives the floor additional comfort and sound benefits. COREtec Plus® floors are waterproof like solid vinyl, but much more rigid, like a laminate floor. The rigidity of the plank hides telegraphing from imperfect subfloors and allows for installation directly over ceramic tile without having to fill grout lines. Due to its superior dimensional stability, COREtec Plus® floors can be installed without acclimation and in large rooms without the need of an expansion gap every 30 ft. COREtec Plus XL® has all of these features as well, but it wider (9”) and longer (72”) plank, making it the largest floating luxury vinyl plank on the market. COREtec Plus® and COREtec Plus XL® are patent-pending products exclusively from USFloors Inc.
May 5, 2015 — Dalton, GA, — USFloors’ patent-pending COREtec® engineered luxury vinyl flooring collection has expanded into Europe with the launch of COREtec Plus® and COREtec One™ in the United Kingdom through the premier UK-based flooring distributor Headlam plc. The program consists of a total of 40 skus, including 15 planks and 5 tiles in the COREtec Plus® construction – 8 mm thick, 20 mil commercially-rated wearlayer with attached cork underlayment. The same collection is also offered in USFloors’ new COREtec One™ construction – 5.5 mm thick, 12 mil residential wear layer without attached cork underlayment – for budget minded consumers and DIY market. COREtec Plus® and COREtec One™ have a patent-pending construction consisting of a top luxury vinyl veneer layer attached to a dimensionally stable, waterproof WPC core. COREtec Plus® products also have an attached cork underlayment which gives the floor additional comfort and sound benefits. COREtec® floors are waterproof like solid vinyl, but much more rigid, like a laminate floor. The rigidity of the plank hides telegraphing from imperfect subfloors and allows for installation directly over ceramic tile without having to fill grout lines. Due to its superior dimensional stability, COREtec® floors can be installed without acclimation and in large rooms without the need of an expansion gap every 30 ft.
Headlam distributes COREtec Plus® and COREtec One™ under a distribution agreement with USFloors and therefore protected from violating USFloors intellectual property rights, filed under the company’s international patent application. Headlam’s COREtec® display shown at UK retailer Special Carpet Co.
COREtec Plus® and COREtec One™ are patent-pending products exclusively from USFloors Inc.
Feb. 26, 2015 — Dalton, GA, — Sean Finn has joined USFContract as a Sr. Account Executive in the southeastern United States. After retirement from a professional soccer career with the Atlanta Silverbacks, Sean entered the floor covering industry and has 14 years experience, most recently with Mannington Commercial. Feb. 9, 2015 — Dalton, GA, — Rick Morris has joined USFloors as Vice President of Sales for the Commercial Sales division, USFContract. He brings 28 years of experience in the commercial flooring industry and will be responsible for the growth of the company’s wood, cork, bamboo and its engineered vinyl plank and tile collection within this channel. Prior to joining USFloors, Rick was Manager Strategic Accounts with Mannington Commercial and Northeast Regional VP with Interface. 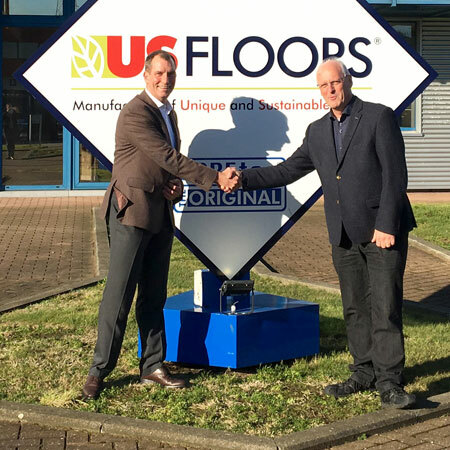 Piet Dossche, CEO of USFloors further elaborated, “Rick brings a wealth of knowledge in building successful, long term relationships with end users, architects, designers and dealers. I am delighted to have him on my team and I’m confident he will manage and grow our commercial business with great success. We are strengthening our organization at all levels by hiring professionals like Rick, to cater to the strong growth we are witnessing”. January 26th, 2015 — Dalton, GA, — USFloors received today a NOTICE OF ALLOWANCE for its COREtec® PATENT APPLICATION # 13/657,750 which was filed on 10/22/2012. “ THE APPLICATION IDENTIFIED ABOVE HAS BEEN EXAMINED AND IS ALLOWED FOR ISSUANCE AS A PATENT”. The patent will give USFloors patent protection for its popular COREtec® LVT collection, including COREtec Plus®, COREtec Plus XL®, COREtec Plus HD™, COREtec One™, SMARTCORE®, Stratum®, Stratum XL®, INNOVA™, Fusion™ Hybrid Floors, Vision™ Hybrid Floors, as well as any future products developed and sold under the protection of its patent. The exclusive Beaulieu of America “ COREtec One™ by Bliss® collection, introduced early this year and extensively featured by the company during Surfaces 2015 in Las Vegas, will also fall within the scope of USFloors’ Intellectual Property (IP) rights and protection. USFloors President and CEO, Piet Dossche, was very happy with this Notice of Allowance, a firm recognition and confirmation by the USPTO of the COREtec® product as a USFloors invention worthy of patent protection. “I am extremely excited with the Notice of Allowance we received today from the USPTO, as it validates the innovation and development we have brought to the flooring industry with our COREtec® LVT collection. This product has been in development since early 2010 and we have invested a lot of time and money to bring this new flooring product to the market and to have our patent application filed and successfully allowed”.